The 2012 London Paralympics may have put off some people with a disability taking up exercise, a former sports star who has multiple sclerosis has suggested. Alastair Hignell, who played rugby union for England and cricket for Gloucestershire before becoming a broadcaster, said its athletes were so “superhuman” that many with a disability would not think of having a go. The online ComRes survey, conducted in October, involved 2,051 British adults, including 474 people with a disability or long-term physical or mental health condition. It suggested that most Britons, including disabled people, thought there had been a positive legacy overall from the Paralympics, with similar percentages, 67% for all adults, 64% for those with a disability, agreeing with the proposition. However, one in five disabled adults thought this had not been the case, compared with one in eight of all adults surveyed. The public as a whole were also more likely than those with a disability – 57% to 53% – to disagree with the suggestion that social perceptions of disabled people had not changed after 2012. A third of disabled people, however, agreed with it, compared with a quarter of all adults. Seven in 10 of all Britons and those with a disability agreed they would like to do more exercise. 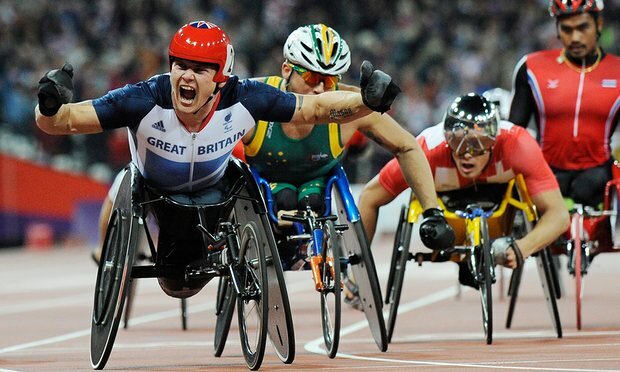 Disabled people (51%) were in line with the public as a whole (48%) in feeling that sporting competitions for disabled athletes should be integrated into the same athletics events as those involving non-disabled athletes, such as the Olympics. About three in 10 in both groups disagreed with the proposition. ix in 10 disabled people said that the accessibility of facilities had no impact on their likelihood to exercise, indicating that the effect of better facilities might be “more a desire” among disabled adults than a firm belief, the survey found. He was concerned by the indication that 47% of disabled adults had not completed 30 minutes or more of moderate exercise on any day of the past week. This compared with 28% of non-disabled adults. Concerted health education schemes were needed to help change people’s mindset, Hignell said. “It is bloody hard being disabled. You haven’t got any energy ... to get out there and do something, any sort of exercise. There aren’t enough physiotherapists around, for instance, to help people who are severely disabled. Hignell thinks the London Paralympics had a positive impact on social attitudes towards disabled people – with more people offering help on public transport, for instance. Channel 4’s coverage of the sport had been “brilliant” but its launch of The Last Leg comedy show during the event also showed “we do have a sense of humour, we can laugh at ourselves, which it is absolutely crucial”. While mass-participation events such as marathons already successfully put events for elite disabled athletes under the same banner as athletes without disability, the merging of the Olympics and Paralympics under one roof was “an impossibility”, said Hignell. “With the number of different delineations there are in each Paralympic event – even for the 100 metres there are eight or nine categories – you are going to have so many events. Public Health England recognised more needed to be done to help people with disabilities exercise, said Justin Varney, its interim deputy director for health and wellbeing. “It is important for everyone, including people with disabilities, to be physically active regularly. “Adults should aim to meet the recommended 150 minutes of moderate physical activity per week, but the guidelines should of course take into account any health or impairment issues.